NextGen Healthcare is a healthcare software that helps streamline several processes for ambulatory practices such as clinical care, population health, and financial management. It is equipped with beneficial features such as electronic health record (EHR), interoperability, analytics, financial services, and mobile solutions. The system has components for supporting ambulatory practices such as dedicated account care, smooth clinical features, automated registry reporting, and EHR. It makes data exchange between relevant parties such as patients and health registries more efficient. It also helps the clinics to build better patient engagements to encourage them to acquire their services again when needed. NextGen Healthcare provides a complete healthcare solution and more as it not only simplifies healthcare processes but it also features tools such as financial management. This allows clinics to focus more on other relevant processes since the system can be trusted in doing its job accurately and efficiently. Through the cloud-based EHR platform, users are able to view all relevant information on just one screen. It is also customizable. Users can configure basic settings to view the specific contents that they needed to see. The initial screen or dashboard can be configured in several ways as well. Several modules such as problems, workflow, medication, and allergies can be selected for organized viewing. Users can also customize drug information by configuring the settings for the formulary. 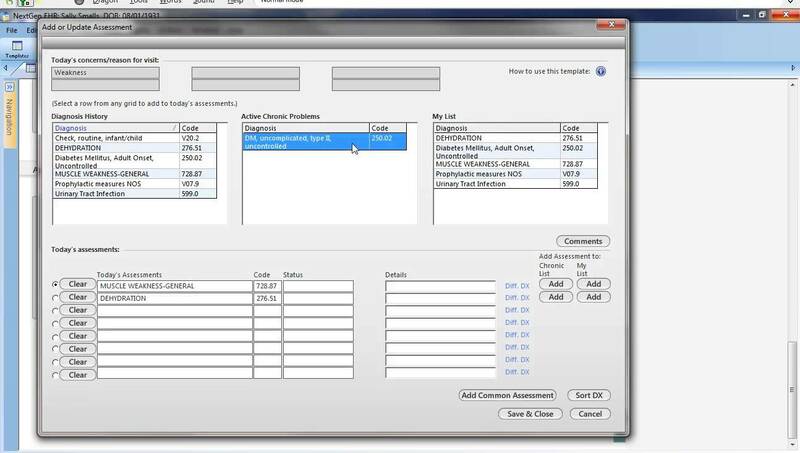 Users can organize their view of drugs by changing some formulary settings such as display chemical name, display OTC meds, and display-only drug. There are also available templates to choose from. These configuration options allow providers and physicians to create an organized medical record tailored for their own convenience. Another useful feature of NextGen EHR is the workflow screen which provides a view of clinical appointments, clinical tasks, and appointment queue. These features work together to streamline clinical workflows as well as healthcare that gives a clinic the ability to provide faster value-based care. The clinical tasks section of the workflow screen allows users to create, reassign and update tasks. This section provides the interface for accessing patient information such as medications, allergies, problems, and diagnoses. Links to this information are provided to the users when they select a certain task or patient. Appointment information can also be viewed from this screen. Scheduled appointments can be viewed in accordance with their resources. It means that they can view appointments of specific offices as well as the schedule of their physicians and providers.